ASTM A312 Heavily Cold Worked Austenitic Stainless Steel Pipes, ASTM A358 SS EFW Pipes, Austenitic Chromium-Nickel Stainless Steel Pipe, SS Pipes, SS Hexagonal Pipe Dealer in India. 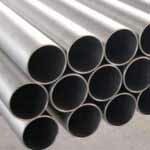 Suppliers of ASTM A312 Stainless Steel Seamless Pipes, Stainless Steel Pipe, SS Electropolished Pipes Exporter, Stainless Steel Hexagonal Pipe, SS Welded Pipe, Stainless Steel Pipe Supplier in Mumbai, India. Ganpat Industrial Corporation is one of the prominent manufacturer, dealer and trader for Stainless Steel Pipes, which is quite ductile and forms easily. We also offer the same in different grades such as Stainless Steel 304 Pipes, Stainless Steel 316 Pipes, Stainless Steel 310 Pipes, Stainless Steel 317 Pipes, Stainless Steel 316TI Pipes, Stainless Steel 347 Pipes, Stainless Steel 410 Pipes, Stainless Steel 446 Pipes, Stainless Steel 904L Pipes, and more. We hold adequate stock of construction material for Stainless Steel Seamless Pipes to hand over accurate product in stipulated time span as per requirement. Our Stainless Steel Welded Pipes is resistant to general corrosion but may be quickly attacked by environments that cause breakdown of the protective oxide, where these include hydrofluoric (HF), hydrochloric (HCl), sulphuric and phosphoric acids. Stainless Steel EFW Pipes resists attack by pure hydrocarbons, and most chlorinated and fluorinated hydrocarbons (provided water has not caused formation of small amounts of HCl and HF). With good general corrosion properties, our Stainless Steel ERW Pipes usage has expanded in chemical, petrochemical and power generation plants. Our expertise in global logistics enables us to source Stainless Steel Round Pipes from anywhere in the world in a matter of days and provide fast shipping solutions to all our customers, whichever country they are in. Our Stainless Steel Round Pipes provides highly safe and reliable operations, where our brand is now became the synonymous of the high quality. 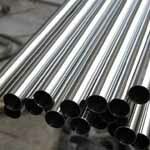 Stainless Steel Seamless Pipe may be furnished bare or coated and with capped ends. pipes up to 3” OD will be supplied in bundles. In order to prevent rust during sea shipment, bundles of Stainless Steel Seamless Pipe may be wrapped with polypropylene sheets, and secured with flat steel bands. Over 3” OD will be supplied loose. Secunderabad, Baroda, Jamshedpur, Haryana, Bhopal, Calgary, Caracas, Algiers, New Delhi, Ahvaz, Kuala Lumpur, Cairo, Gurgaon, Jaipur, Istanbul, Thiruvananthapuram, Lahore, Ankara, Vung Tau, Riyadh, Nashik, Houston, Tehran, Dubai, Moscow, Kolkata, Faridabad, Kanpur, Noida, Rajkot, Ulsan, Singapore, Perth, Los Angeles, Rio de Janeiro, Thane, Edmonton, Seoul, Ho Chi Minh City, Brisbane, Vadodara, Port-of-Spain, New York, Bengaluru, Karachi, Manama, Bogota, Aberdeen, Coimbatore, Melbourne, Muscat, Granada, London, Sharjah, Ahmedabad, Hyderabad, Chandigarh, Al Khobar, Surat, Gimhae-si, Howrah, Dammam, Santiago, Ernakulam, Colombo, Bangkok, Ludhiana, Atyrau, Sydney, Visakhapatnam, Abu Dhabi, Ranchi, La Victoria, Mumbai, Madrid, Lagos, Chiyoda, Doha, Al Jubail, Nagpur, Jakarta, Petaling Jaya, Toronto, Montreal, Dallas, Busan, Hanoi, Pimpri-Chinchwad, Navi Mumbai, Hong Kong, Chennai, Jeddah, Courbevoie, Pune, Milan, Mexico City, Geoje-si, Indore, Kuwait City. Yemen, Ecuador, Iran, Sweden, Saudi Arabia, Iraq, South Africa, Denmark, Serbia, Turkey, Macau, Mongolia, Afghanistan, Romania, Spain, Austria, Canada, Brazil, Kazakhstan, Mexico, Chile, Hong Kong, Nigeria, Algeria, Gambia, Thailand, Kuwait, Finland, Norway, Greece, Indonesia, Iran, France, Australia, Oman, Pakistan, Nigeria, Jordan, New Zealand, Bahrain, Mexico, Costa Rica, Bhutan, South Korea, Lebanon, Zimbabwe, Italy, Bolivia, Philippines, United States, Ukraine, Vietnam, Ireland, Bangladesh, Colombia, Germany, Japan, Switzerland, Libya, Azerbaijan, Sri Lanka, Gabon, Kenya, Croatia, Tibet, Egypt, Russia, Belarus, India, Qatar, Bulgaria, United Kingdom, Venezuela, Malaysia, Peru, Poland, Hungary, Argentina, Slovakia, Israel, United Arab Emirates, Angola, Lithuania, Czech Republic, China, Netherlands, Nepal, Puerto Rico, Poland, Ghana, Taiwan, Singapore, Belgium, Namibia, Estonia, Morocco, Portugal, Trinidad & Tobago,Tunisia, Chile.